Ok I'm don't usually rant but I'm going to just a little. Sometimes I love the internet and sometimes I hate it. I love it when I find inspiring ideas and awesome people. I hate it when I happen upon a multitude of incomplete, missing or just bad execution of ideas when I really looking for something. This is what happened last week with basically every good looking recipe I found. I guess it's a good reminder that anyone can post to the internet and that if I want a for sure good recipe I need to use an actual cookbook. When I finally came across one blog with a good looking meal with an actual recipe I went with it even though I was met with floating adds on the top and bottom and a pop-up ad so I could barely see the site content (I get that you want to make money on your site but I find this annoying... maybe that's bad business on my end but I don't like it). I got the ingredients and went to make it. Then I read the instructions and realized that they were worthless. They amounted to: mix everything together. I was pretty disappointed. Based on my lack of success this week in finding inspiring meals, I decided to post the recipe that I put together to save the meal I started. I'm not going to bother to post the link of the original blog since I drastically changed both the ingredient amounts and the instructions. (plus I don't want you to get inundated by ads). So instead, here is my version of Thai Spaghetti Squash with Chicken. Preheat your oven to 350˚ F. Cut the squash in half and lay the pieces cut side down on a lipped cookie sheet. Add just enough water to the cookie sheet to cover the bottom. Cook the squash for 30-40 min or until a fork can easily puncture the skin of the squash. While the squash is cooking, prepare the sauce. Heat the sesame oil in a sauté pan over medium heat. Once hot, add the curry paste, ginger, cinnamon and black pepper. Cook a few minutes until fragrant then add the coconut cream, milk and peanut butter. Stir until the peanut butter is melted and then add the fish sauce, honey and soy sauce. Cook for 2 more minutes and then transfer all but a 1/4 cup of sauce into a separate bowl. Cook the chicken in the remaining sauce. Once the squash is done, use a fork to separate the meat from the skins (you might want to let it cool for a few minutes). Add the squash and chicken back into the sauté pan and pour in the sauce. Mix everything together over low heat until combined. 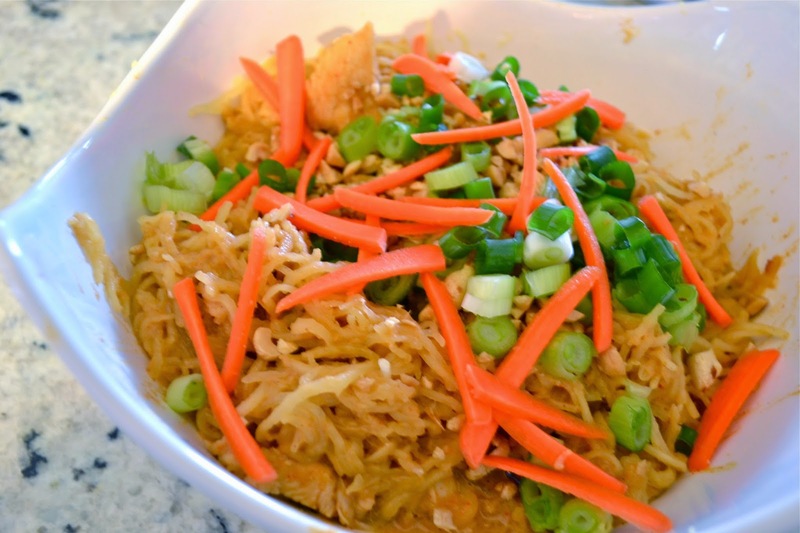 Once combined, you can top you thai spaghetti squash with peanuts, green onions, sliced carrots or other things like sprouts or a little sriracha. This is a great low calorie dish if you are really in the mood for some thai but don't want the carbs.